Note 1: It is an unfortunate consequence of the internet age to be forced to address public misconceptions of research that is published by press-release rather than peer-review. Society & science are not served well from the absence of even cursory peer-review. It should be noted that some of the authors in the paper have a colorful past, but the critique below will be on evidence provided within the manuscript the authors have submitted. In Marinov’s element 122 paper, Evidence for a long-lived superheavy nucleus.., a fantastical claim is made for the identification of element 122 with standard thorium samples. It should be strenuously noted that element identification (id est determination of the number of protons, atomic number (Z)) can not be definitively determined by mass spectrometry when the exact mass of the element is not known. Yes, there are many models that can extrapolate what the mass of an unknown isotope should be, but overly broad best guessing is not the way science in conducted. The paper infers a mass accuracy for their mass spectrometer of 0.040 amu and this error will be used to determine the validity of their data. The first figure showing evidence of element 122 is shown below. The figure shows their data from summing the thorium sample 5 times from their 1st run. As the figure is lacking a significantly intense peak near 292.010 amu corresponding to 238U40Ar14N+ that is seen in later runs, I would be forced to chalk those signals to inherent noise in the instrument, especially as no blank spectrum was provided as reference for this data series. 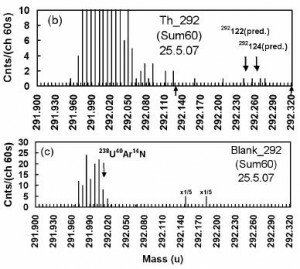 The figure shows their data from summing the thorium sample 60 times from their 2nd run. Top spectra is sample, bottom spectra is of the blank. The peaks from 238U40Ar14N+, mentioned earlier, can be clearly seen in this spectrum. The authors fail to scale the blank’s intensity (y-axis) to the same level as the sample which makes comparisons unnecessarily difficult. The blank’s intensity axis is larger than that of the samples, which is very unusual as one tends to have to zoom into a blank rather than zoom out to make a scientific point. I am also confused as to what the peaks labeled x1/5 mean (was data altered to scale these peaks down? ), I do not know. As the x1/5 peaks in the blank are not seen in their thorium sample, one has to wonder why this is so. Has the detection limit already been reached? 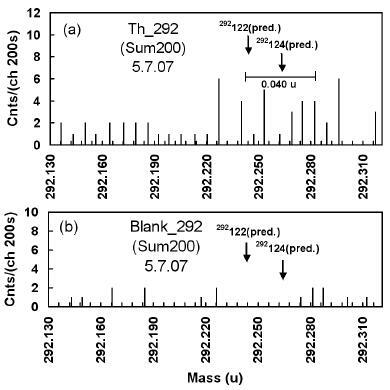 The figure shows their data from summing the thorium sample 200 times from their 3rd run. Top spectra is sample, bottom spectra is of the blank. This data set has the largest statistics as it is a sum of 200 spectra. The blank in this figure has obvious peaks near 292.230 and 292.280 amu. The blank peak at 292.230 is also seen in the sample spectrum, and is now a dominant peak in that spectrum. Any good data set should be at least 3 times the peak height of blank noise, when the signals are so close together, but this is not the case in this figure. Even if referencing the 2nd blank peak at 292.280, the signals attributed to element 122 are at best 2-2.5 times blank background peaks. The claim that there was no molecular ion formation from hydrocarbon presence from their vacuum pump is also not realistic. From the sensitivities claimed in the paper the presence of pump oil should of been detected. The authors give several theoretical hypotheses why element 122 should be stable, but these claims will not be evaluated as I see no convincing evidence of the identification of element 122. Note 4: Mitch is a nuclear chemistry PhD student at UC Berkeley studying the chemistry and physics of elements above Lawrencium (Z>103) in the Heavy Element and Actinide Chemistry group. Considering the undeniable fact that ethnic jews have so far received about 2/3 to 3/4 of all science Nobel prizes ever issued, I would say this find of element 122 is real and he will also get the gold medal for his exceptional find. Ashkenazi jews have been proven by several surveys to be the single most intelligent group among humans, on average 3-5 points of IQ ahead of white british anglo-saxons and germans, etc. Science and technology is highly advanced in the jewish state, thus I don’t see much reason to doubt their claims (especially when you are judging a mere press release, which is by necessity an incomplete and shortened version). Regardless of intelligence, the data the authors supplied still does not validate the conclusions drawn. I think it is really not necessary to draw the discussion in this direction, as Mitch has been completely objective in his critique. I’m impressed how that initial post didn’t snowball. I hope the authors of this ArXiv paper take your comments into consideration before they submit for peer review! Maybe they can present their data in better ways to make it more convincing. I didn’t actually see a press release (although I only looked briefly) and you can hardly say that publishing a paper on the arxiv is publishing by press release or that “society & science are not served well from the absence of even cursory peer-review” for those arxiv papers. Overall peer-review is important, but publishing preprints before peer review on the arxiv helps advance science and (I would argue) therefore society. Besides, the power of the internet in addressing these claims is what I find more exciting. (recall that cold fusion was pre-internet). Since there is clear confusion whether the paper was peer-reviewed from reading websites and news sources, I am solidly in the corner that the preprint service is silly. You were right there was no stereotypical press release, but I was using the term loosely. Although, since the blog of the publisher covered the paper, I would argue that it was very similar in nature. I think you’ve misunderstood the status of the arxiv and of the “Physics Arxiv Blog.” Arxiv.org is a preprint service currently run by Cornell University library that allows researchers to rapidly share their work. As far as I know it is not used by chemists (or certainly not widely), but in some fields of physics (most notably high energy physics) it is the most important means of communicating research to ones peers. The fact that some websites and news sources don’t understand that most preprints submitted have not yet been peer reviewed (although many do go on to be published in peer reviewed journals later) does not make it “silly”. The “Physics Arxiv Blog” is not officially associated with the arxiv, although judging from the posts, I do think it is run by a physicist. Most chemical publishers wouldn’t publish a paper that is already in the public domain, so this may be a mute point for chemists. I’m glad ArXiv has been shown to be successful previously, but the fact this paper has attracted as much attention as it has, I feel, makes my point about non peer-review services. Nice Job, Mitch. Good summaries of what their figures show…and what they don’t. This would be exciting if true, but such a low N/Z ratio combined with sparse data leaves me doubtful.